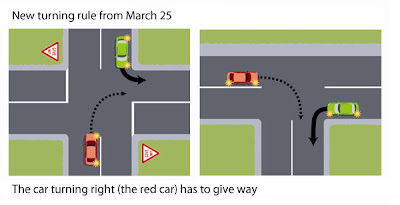 Admittedly, the current give way rules are quite easy to follow because it is a must for you to give way if a vehicle is coming from your right side. However in an intersection with stop lights, if you are driving straight ahead, then you have the right of way vs a vehicle coming from the opposite road and turning to pass you from your right. But this one's confusing because some drivers tend to give way and so you don't know if you should proceed or not unless both of you have clearly communicated your intention (flashing of lights / hand gesture). However, the give way rule can sometimes be a source of wonderment. Consider the two scenario below. In the current ruling, the green car has to give way to the turning red car. But the more sensible way is for the green car to actually make the turn first because it is closer to the turning point. But not all give way rules are changing. I will let the experts discuss this further. A good explanation is at the TVNZ website (photo credit above is also to TVNZ), with a further link to the NZ Transport Agency.